Western Regional Delivery Service is a Los Angeles based carrier providing transportation and logistics services throughout the United States. Uniquely positioned, WRDS is close in proximity to the Ports of Los Angeles and Long Beach and allows WRDS to handle your products and streamline your logistical requirements. Strategic logistical demands require a company like WRDS to develop a true working partnership with our clients. WRDS has the ability to meet or exceed our customers expectations regarding transit times and service reliability and dependability. WRDS technology advancements include all forms of Electronic Data Interchange (EDI), imaging documentation, and “real time” tracking and tracing solutions. It is our objective to become a viable part of your supply chain process earning your business through our proven methods of service and performance. Our goal is to become an extension of your organization through our strategic initiatives and innovative services. WRDS has been awarded a certificate of achievement for attaining Six consecutive satisfactory safety compliance ratings since June 10, 1991 in the Biennial Inspection of Terminals (BIT) Program. 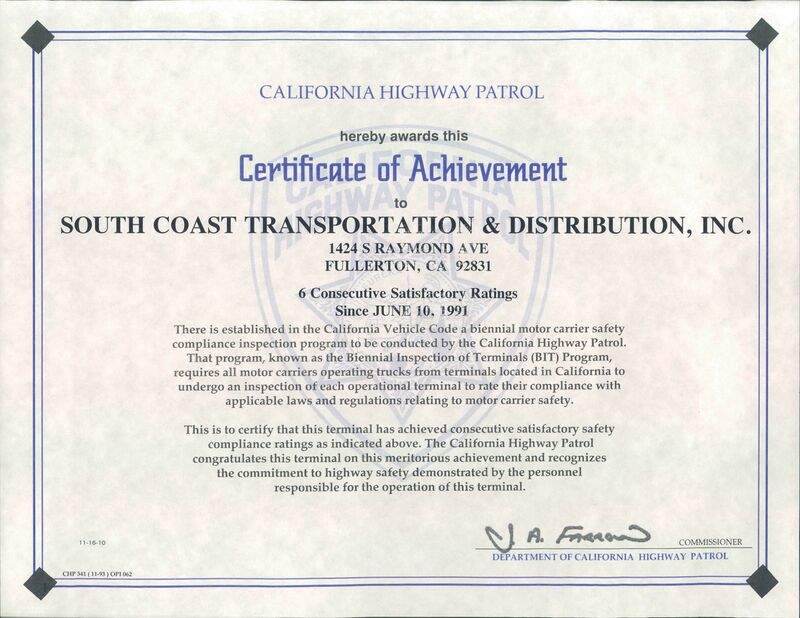 The California Highway Patrol (CHP) Certified WRDS commitment to safety, which has been demonstrated by the proper operation of the truck terminals at the Fullerton Terminal. WRDS full truckload service division offers single and team service throughout the lower 48 states. Air ride equipment and dedicated fleet service is also available. Combining your LTL and FTL requirements allows WRDS to become a viable partner and simplifies the logistics process. WRDS has over 100,000 square feet of racked and floor space for short or long term warehousing. A complete WMS allows us to offer full pick and pack, trans load and De-consolidate and consolidation services in a traditional 3PL atmosphere. Freight forwarding, 3 & 4 PL functions, brokerage, freight auditing, contract management. The programs are customized to meet or exceed your logistical requirements. Our forwarding division includes all tariff management and cost control measures.